This system can help cushion the impact force to the chest area of the driver and front passenger in certain side impact collisions. The side air bags are designed to inflate on the side where the vehicle is impacted. This system can help cushion the impact force to the head of occupants in front and rear outboard seating positions in certain side-impact collisions. The curtain air bags are designed to inflate on the side where the vehicle is impacted. The SRS is designed to supplement the crash protection provided by the driver and front passenger seat belts and is not a substitute for them. Seat belts should always be correctly worn and the occupant seated a suitable distance away from the steering wheel, instrument panel and door finishers. 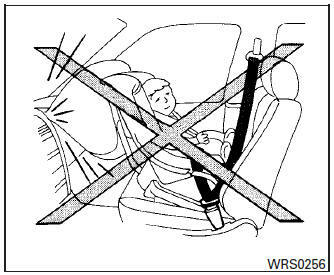 For additional information about instructions and precautions on seat belt usage, refer to “Seat belts” in this section. The seat belts and the front air bags are most effective when you are sitting well back and upright in the seat. The front air bags inflate with great force. Even with the NISSAN Advanced Air Bag System, if you are unrestrained, leaning forward, sitting sideways or out of position in any way, you are at greater risk of injury or death in a crash. You may also receive serious or fatal injuries from the front air bag if you are up against it when it inflates. Always sit back against the seatback and as far away as practical from the steering wheel or instrument panel. Always properly use the seat belts. The driver and front passenger seat belt buckles are equipped with sensors that detect if the seat belts are fastened. The NISSAN Advanced Air Bag System monitors the severity of a collision and seat belt usage then inflates the air bags as needed. Failure to properly wear seat belts can increase the risk or severity of injury in an accident. WARNING To ensure proper operation of the front passenger’s NISSAN Advanced Air Bag System, please observe the following items. Do not place heavy loads heavier than 2.2 kg (1 lb) on the seatback, head restraint/headrest or in the seatback pocket. If you notice that the front passenger air bag status light is not operating, please take your vehicle to a NISSAN dealer to check the occupant classification system. Until you have confirmed with a dealer that your passenger seat occupant classification system is working properly, position the occupants in the rear seating positions. This vehicle is equipped with the NISSAN Advanced Air Bag System for the driver and front passenger seats. This system is permitted in Canada. However, all of the information, cautions and warnings in this manual still apply and must be followed. The driver supplemental front-impact air bag is located in the center of the steering wheel. The front passenger supplemental front-impact air bag is mounted in the dashboard above the glove box. The front air bags are designed to inflate in higher severity frontal collisions, although they may inflate if the forces in another type of collision are similar to those of a higher severity frontal impact. They may not inflate in certain frontal collisions. Vehicle damage (or lack of it) is not always an indication of proper front air bag system operation. The NISSAN Advanced Air Bag System monitors information from the crash zone sensor, the Air bag Control Unit (ACU), seat belt buckle sensors and occupant classification sensor (weight sensor). Inflator operation is based on the severity of a collision and seat belt usage for the driver. For the front passenger, the occupant classification sensors are also monitored. Based on information from the sensors, only one front air bag may inflate in a crash, depending on the crash severity and whether the front occupants are belted or unbelted. Additionally, the front passenger air bag may be automatically turned off under some conditions, depending on the weight detected on the front passenger seat and how the seat belt is used. If the front passenger air bag is OFF, the front passenger air bag status light will be illuminated (if the seat is unoccupied, the light will not be illuminated, but the air bag will be off). For additional information, refer to “Front passenger air bag and status light” in this section. One front air bag inflating does not indicate improper performance of the system. If you have any questions about your air bag system, please contact NISSAN or a NISSAN dealer. If you are considering modification of your vehicle due to a disability, you may also contact NISSAN. Contact information is contained in the front of this Owner’s Manual. Even with NISSAN Advanced Air Bags, seat belts should be correctly worn and the driver and front passenger seated upright as far as practical away from the steering wheel or instrument panel. The front air bags inflate quickly in order to help protect the front occupants. Because of this, the force of the front air bag inflating can increase the risk of injury if the occupant is too close to, or is against, the front air bag module during inflation. WARNING The front passenger air bag is designed to automatically turn OFF under some conditions. which is located on the instrument panel. passenger air bag is OFF and will not inflate in a crash. illuminates to indicate that the front passenger air bag is OFF and will not inflate in a crash. to indicate that the front passenger air bag is operational. In addition to the above, certain objects placed on the front passenger seat may also cause the light to operate as described above depending on their weight. For additional information related to the normal operation and troubleshooting of this occupant classification sensor system, please refer to “Normal operation” and “Troubleshooting” in this section. The occupant classification sensor in this vehicle is a weight sensor. It is designed to detect an occupant and objects on the seat by weight. For example, if a child is in the front passenger seat, the NISSAN Advanced Air Bag System is designed to turn the front passenger air bag OFF in accordance with the regulations. Also, if a child restraint of the type specified in the regulations is on the seat, its weight and the child’s weight can be detected and cause the air bag to turn OFF. 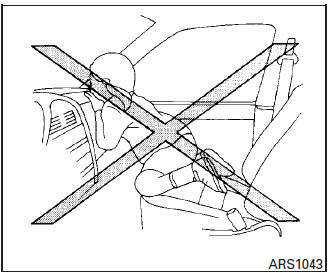 Front passenger seat adult occupants who are properly seated and using the seat belt as outlined in this manual should not cause the front passenger air bag to be automatically turned OFF. For small adults it may be turned OFF, however if the occupant takes his/her weight off the seat cushion (for example, by not sitting upright, by sitting on an edge of the seat, or by otherwise being out of position), this could cause the sensor to turn the air bag OFF. Always be sure to be seated and wearing the seat belt properly for the most effective protection by the seat belt and supplemental air bag. NISSAN also recommends that appropriate child restraints and booster seats be properly installed in a rear seat. If this is not possible, the occupant classification sensor is designed to operate as described above to turn the front passenger air bag OFF for specified child restraints as required by the regulations. 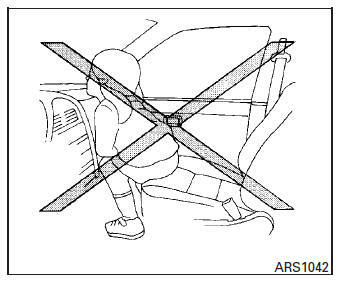 Failing to properly secure child restraints and to use the ALR mode may allow the restraint to tip or move in a collision or sudden stop. This can also result in the passenger air bag inflating in a crash instead of being OFF. 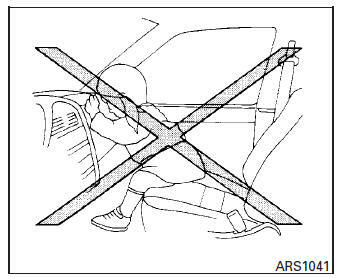 For additional information about proper use and installation, refer to “Child restraints” in this section. If the front passenger seat is not occupied, the front passenger air bag is designed not to inflate in a crash. However, heavy objects placed on the seat could result in air bag inflation, because of the object’s weight detected by the occupant classification sensor. Other conditions could also result in air bag inflation, such as if a child is standing on the seat, or if two children are on the seat, contrary to the instructions in this manual. Using the front passenger air bag status light, you can monitor when the front passenger air bag is automatically turned OFF with the seat occupied. If an adult occupant is in the seat but the front passenger air bag status light is illuminated (indicating that the air bag is OFF), it could be that the person is a small adult, or is not sitting on the seat properly or not using the seat belt properly. If a child restraint must be used in the front seat, the front passenger air bag status light may or may not be illuminated, depending on the size of the child and the type of child restraint being used. If the air bag status light is not illuminated (indicating that the air bag might inflate in a crash), it could be that the child restraint or seat belt is not being used properly. Make sure that the child restraint is installed properly, the seat belt is used properly and the occupant is positioned properly. 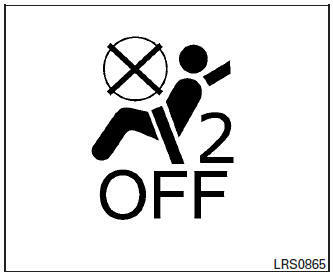 If the air bag status light is still not illuminated, reposition the occupant or child restraint in a rear seat. If the front passenger air bag status light will not illuminate even though you believe that the child restraint, the seat belts and the occupant are properly positioned, the system may be sensing an unoccupied seat (in which case the air bag is OFF). A NISSAN dealer can check that the system is OFF by using a special tool. However, until you have confirmed with your dealer that your air bag is working properly, reposition the occupant or child restraint in a rear seat. The NISSAN Advanced Air Bag System and front passenger air bag status light will take a few seconds to register a change in the front passenger seat status. For example, if a large adult who is sitting in the front passenger seat exits the vehicle, the front passenger air bag status light will go from OFF to ON for a few seconds and then to OFF. This is normal system operation and does not indicate a malfunction. Make sure that there are no objects weighing over 2.2 lbs (1 kg) hanging on the seat or placed in the seatback pocket. Make sure that a child restraint or other object is not pressing against the rear of the seatback. Make sure that a rear passenger is not pushing or pulling on the back of the front passenger seat. Make sure that the front passenger seat or seatback is not forced back against an object on the seat or floor behind it. Make sure that there is no object placed under the front passenger seat. Adjust the seat as outlined in the “Seats” section of this manual. Sit upright, leaning against the seatback, and centered on the seat cushion with your feet comfortably extended to the floor. Make sure there are no objects on your lap. 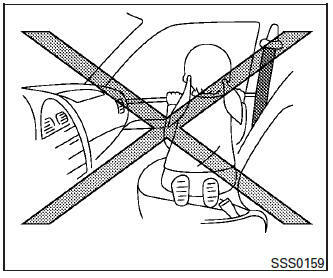 Fasten the seat belt as outlined in the “Seat belts” section of this manual. 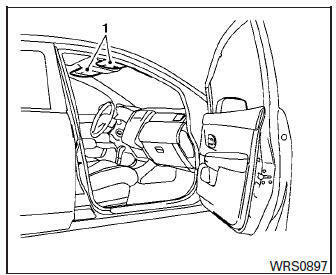 Remain in this position for 30 seconds allowing the system to classify the front passenger before the vehicle is put into motion. Ensure proper classification by checking the front passenger air bag status light. NOTE: This vehicle’s occupant classification sensor system locks the classification during driving so it is important that you confirm that the front passenger is properly classified prior to driving. Also, the occupant classification sensor system may recalculate the weight of the occupant when the vehicle comes to a stop (i.e. stop light, stop sign, etc. 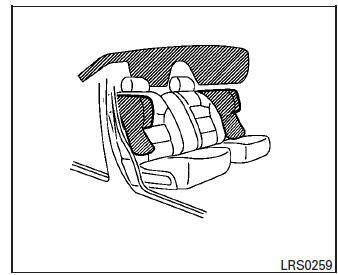 ), so front passenger seat occupants should continue to remain seated as outlined above. An object weighing over 2.2 lbs (1 kg) hanging on the seat or placed in the seatback pocket. A child restraint or other object pressing against the rear of the seatback. A rear passenger pushing or pulling on the back of the front passenger seat. Forcing the front seat or seatback against an object on the seat or floor behind it. An object placed under the front passenger seat. An object placed between the seat cushion and center console or between the seat cushion and the door. If the vehicle is moving, please come to a stop when it is safe to do so. Check and correct any of the above conditions. Restart the vehicle and wait 1 minute. NOTE: A system check will be performed during which the front passenger air bag status light will remain lit for about 7 seconds initially. If the light is still ON after this, the vehicle should be checked by a NISSAN dealer as soon as possible. Occupant is a small adult — the air bag light is functioning as intended. The front passenger air bag is suppressed. Occupant is not sitting upright, leaning against the seatback, and centered on the seat cushion with his/her feet comfortably extended to the floor. If the light is still ON after this, the person should be advised not to ride in the front passenger seat and the vehicle should be checked by a NISSAN dealer as soon as possible. If the light is OFF with a small adult, child or child restraint occupying the front passenger seat. Small adult or child is not sitting upright, leaning against the seatback, and centered on the seat cushion with his/her feet comfortably extended to the floor. 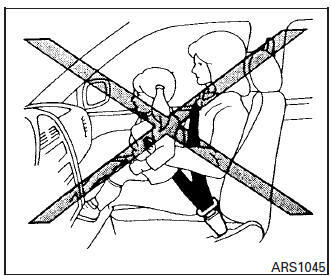 The child restraint is not properly installed, as outlined in the “Child restraints” section of this manual. An object placed between the seat cushion and center console. NOTE: A system check will be performed during which the front passenger air bag status light will remain lit for about 7 seconds initially. 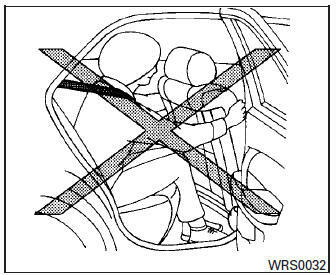 If the light is still OFF after this, the small adult, child or child restraint should be repositioned in the rear seat and the vehicle should be checked by a NISSAN dealer as soon as possible. Removing or modifying the front passenger seat may affect the function of the air bag system and result in serious personal injury. The side air bags are located within the outboard side of the front seatback. The curtain air bags are located in the side roof rails. All of the information, cautions and warnings in this manual must be followed. The side air bags and curtain air bags are designed to inflate in higher severity side collisions, although they may inflate if the forces in another type of collision are similar to those of a higher severity impact. They are designed to inflate on the side where the vehicle is impacted. They may not inflate in certain side collisions. The pretensioner(s) cannot be reused after activation. They must be replaced together with the retractor and buckle as a unit. If the vehicle becomes involved in a collision but pretensioner(s) are not activated, be sure to have the pretensioner system checked and, if necessary, replaced by a NISSAN dealer. No unauthorized changes should be made to any components or wiring of the pretensioner system. This is to prevent damage to or accidental activation of the pretensioner(s). Tampering with the pretensioner system may result in serious personal injury. If you need to dispose of the pretensioner( s) or scrap the vehicle, contact a NISSAN dealer. Incorrect disposal procedures could cause personal injury. The pretensioner system may activate with the supplemental air bag system in certain types of collisions. Working with the seat belt retractor, the pretensioner(s) help tighten the seat belt when the vehicle becomes involved in certain types of collisions, helping to restrain front seat occupants. The pretensioner(s) are encased within the seat belt retractor and to the seat belt anchor affixed to the floor of the vehicle. These seat belts are used the same way as conventional seat belts. When pretensioner(s) activate, smoke is released and a loud noise may be heard. This smoke is not harmful and does not indicate a fire. After the pretensioner(s’) activation, load limiters allow the seat belt to release webbing (if necessary) to reduce forces against the chest. used to indicate malfunctions in the pretensioner system. For additional information, refer to Supplemental air bag warning light in this section. The warning labels are located on the surface of the sun visors. 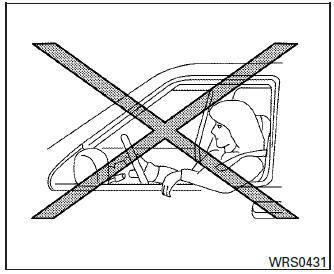 Warning labels about the supplemental frontimpact air bag system are placed in the vehicle as shown in the illustration.